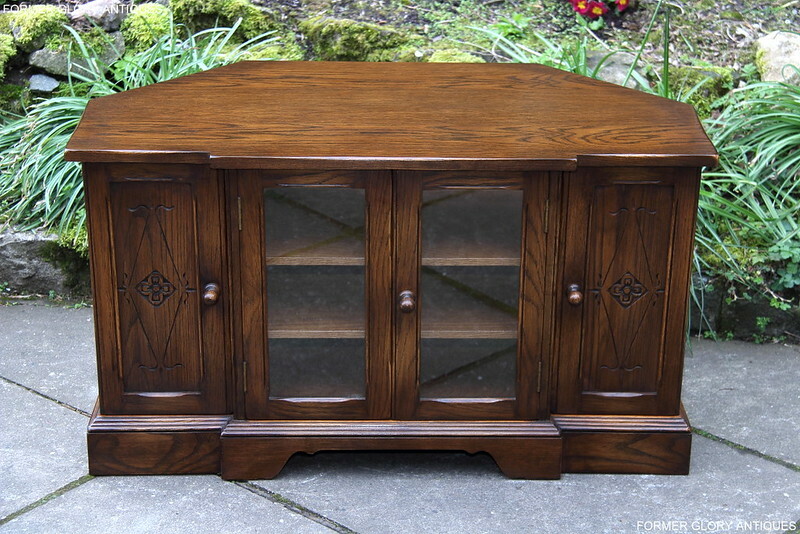 CARVED OAK CORNER TV CABINET / STAND. 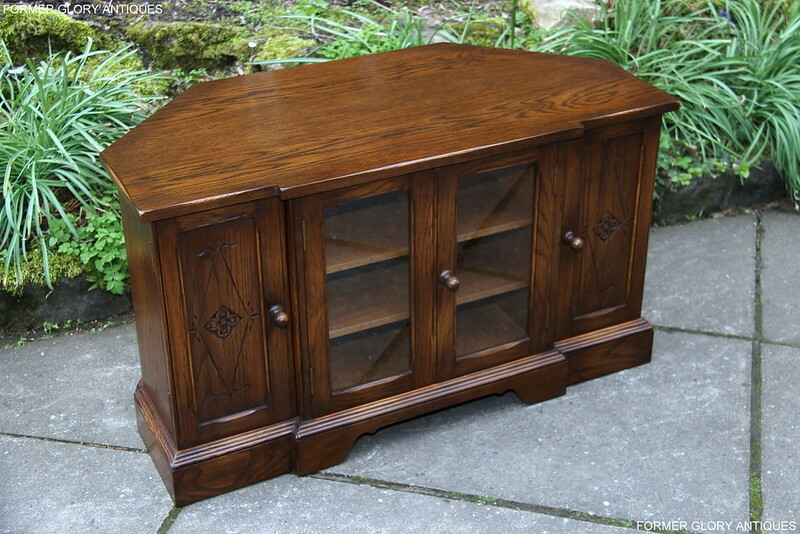 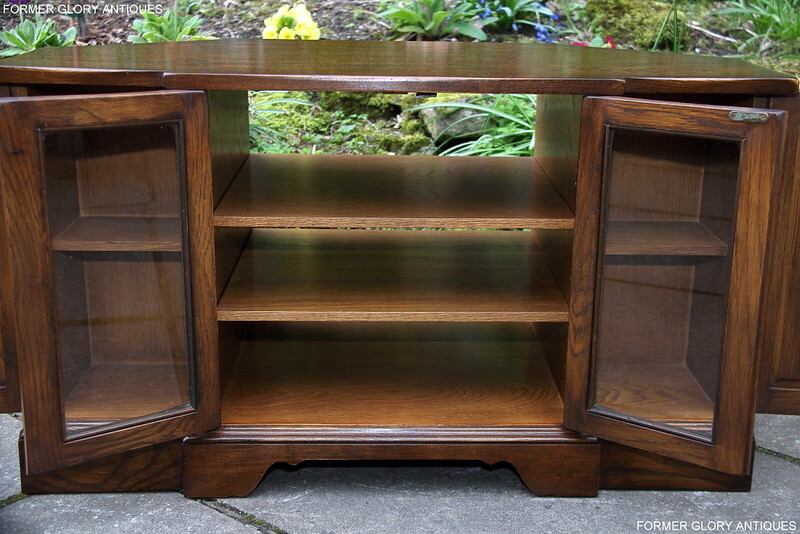 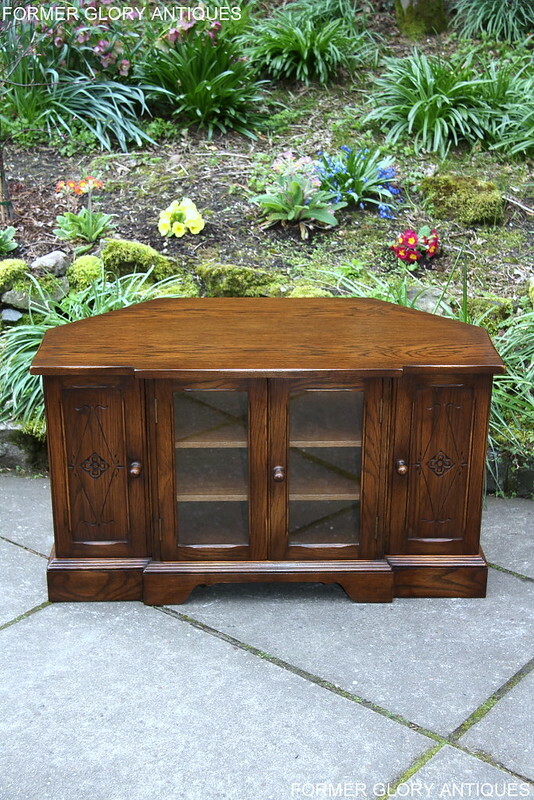 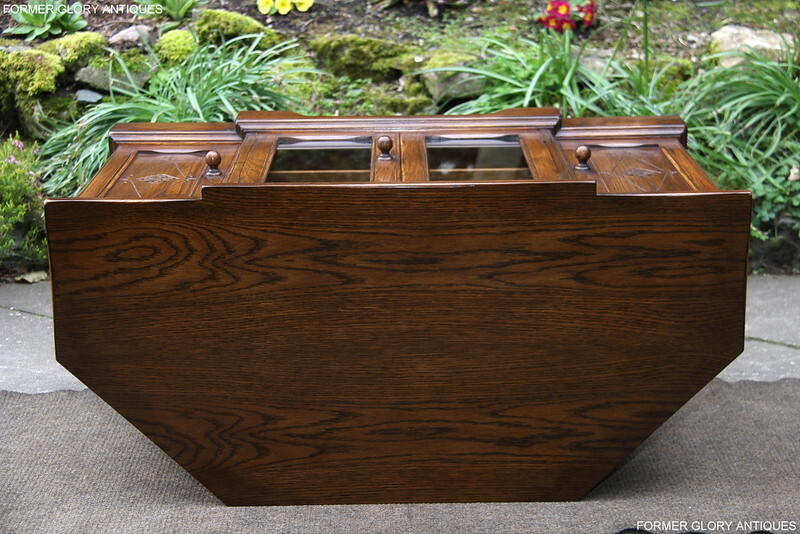 A VERY ATTRACTIVE, LATE 20th CENTURY, 'BREAKFRONT', CARVED OAK, CORNER T.V. 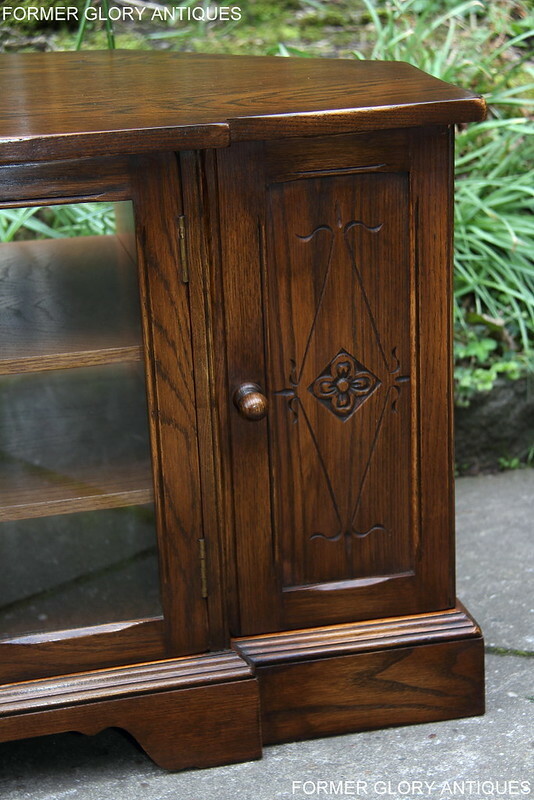 CABINET / STAND, OF EXCEPTIONAL QUALITY AND CONDITION. 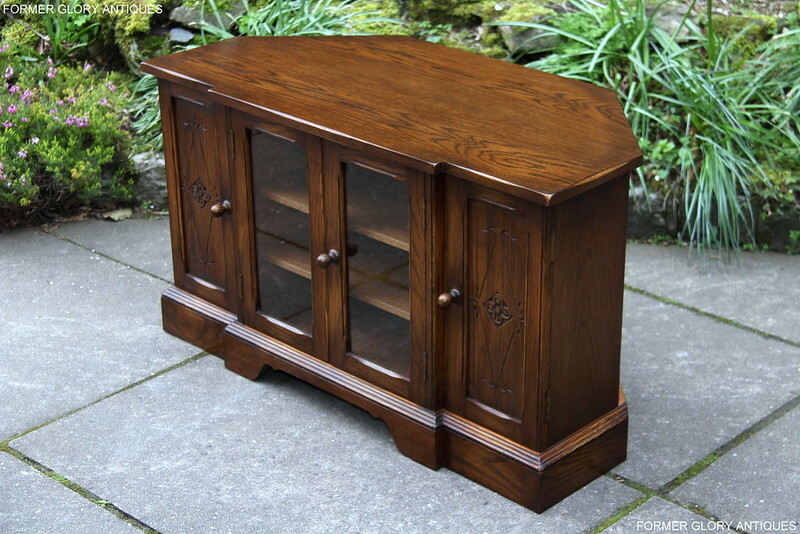 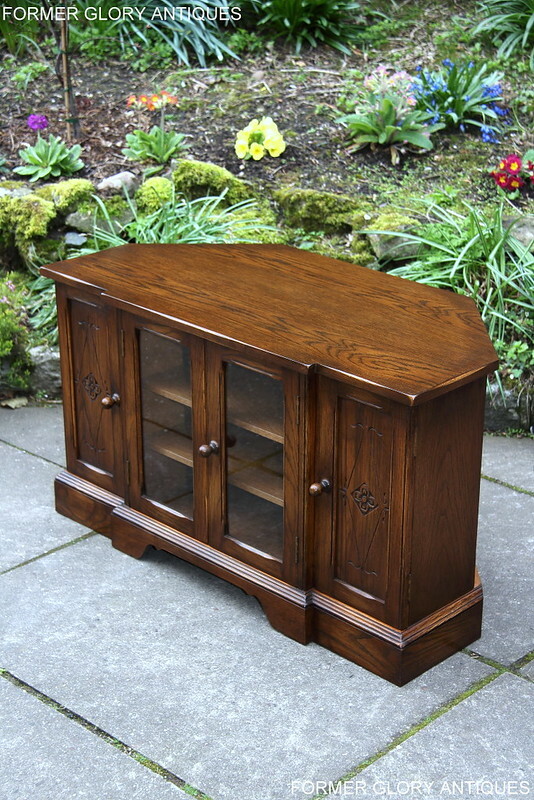 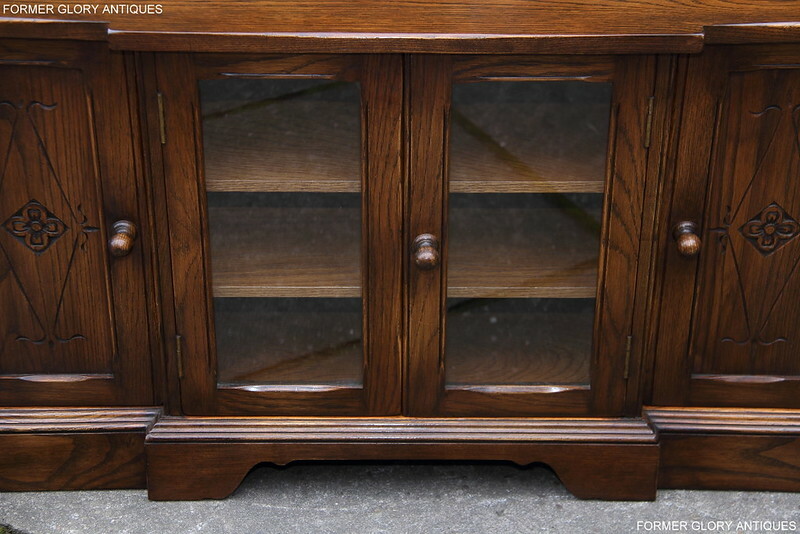 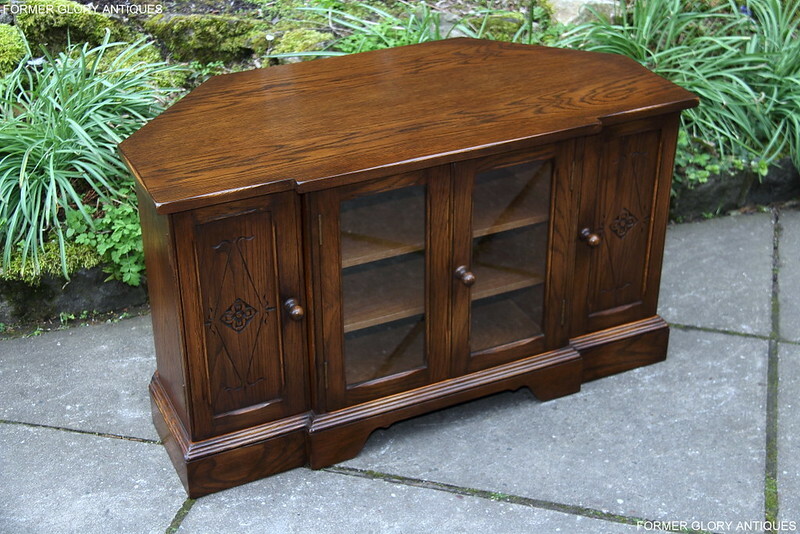 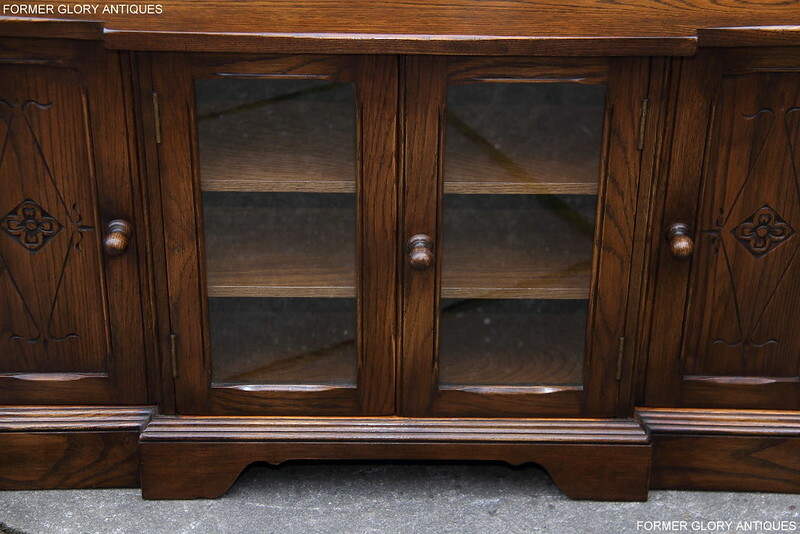 THIS FABULOUS OAK TV CABINET IS OF THE VERY BEST QUALITY AND IS MADE BY ONE OF THE LEADING FURNITURE MANUFACTURERS IN TODAY'S MARKET PLACE. 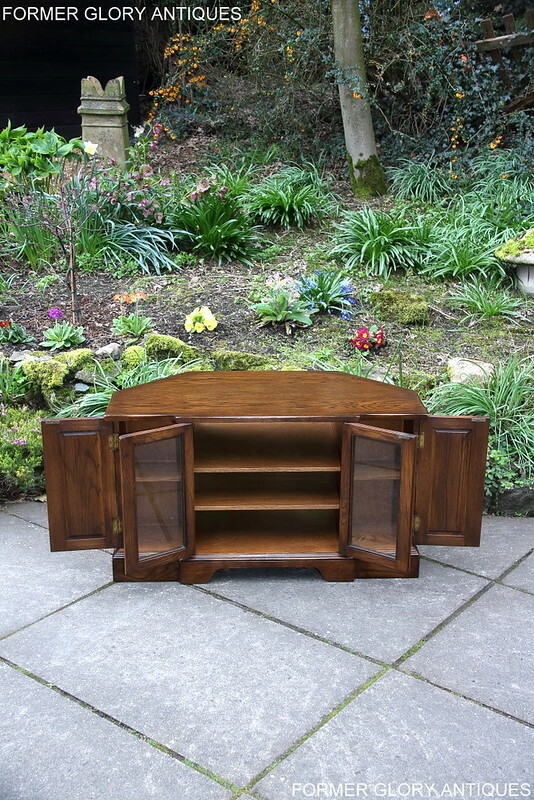 IT IS THE FAMOUS 'BEVAN FUNNELL' 'REPRODUX' FURNITURE COMPANY, OF NEWHAVEN, SUSSEX, ENGLAND. 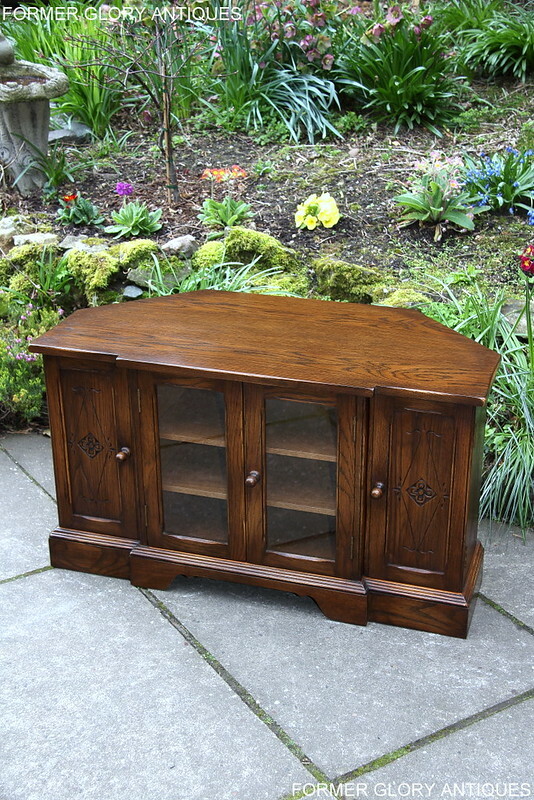 THE CABINET IS MADE IN THE TRADITIONAL 'GEORGIAN STYLE' USING THE BEST QUALITY OAK TIMBER, VENEERS AND FINISHES AVAILABLE. 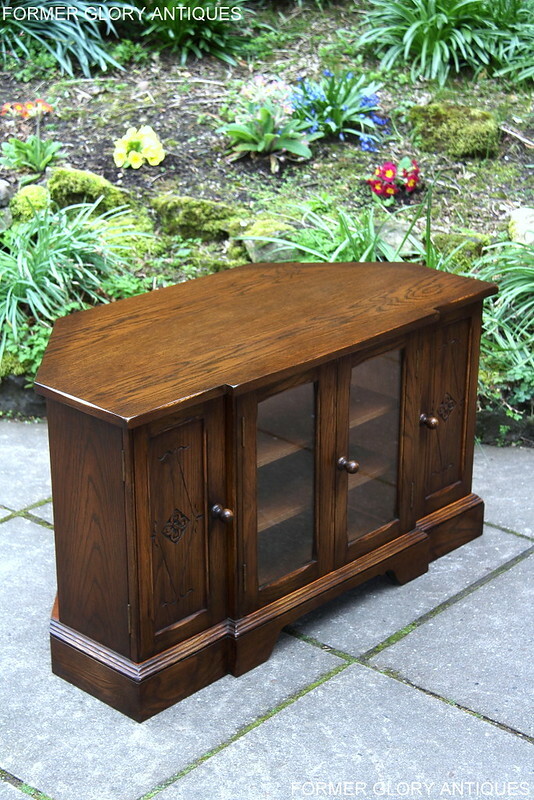 IT HAS ATTRACTIVE OAK-WOOD GRAINING THROUGH-OUT AND WOULD SIT NICELY WITH OTHER MATCHING 'BEVEN FUNNELL' 'REPRODUX' ITEMS OF FURNITURE. 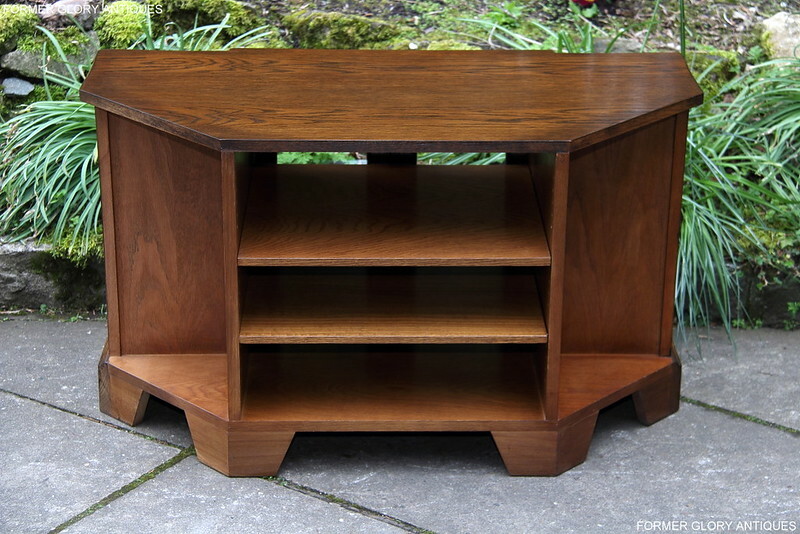 THE T.V CABINET HAS A FIXED, ANGULAR TOP, WITH TRADITIONAL, 'BREAKFRONT', STRAIGHT CUT EDGES AND ROUNDED CORNERS. 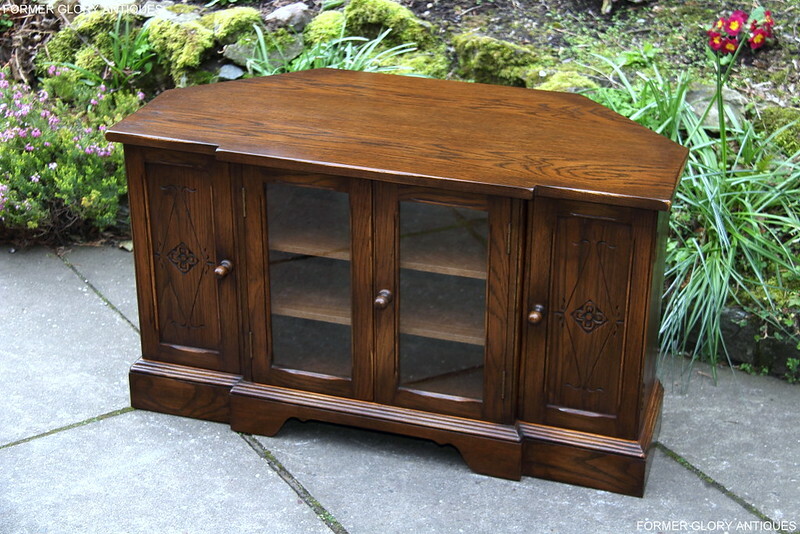 IT CAN BE SITUATED IN ANY CORNER OF A ROOM AND IS IDEAL FOR A FLAT SCREEN TELEVISION TO STAND ON. 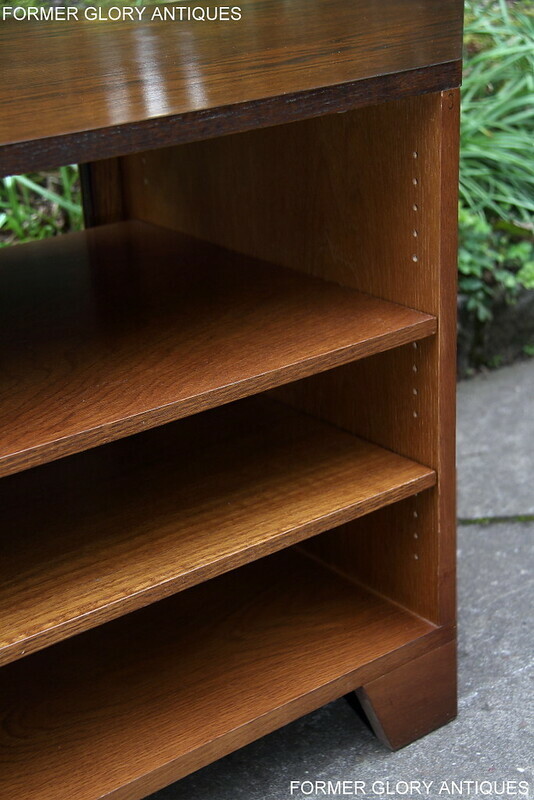 THE CABINET HAS TWO ADJUSTABLE SHELVES INSIDE THE CENTRE COMPARTMENT, WHICH PROVIDE AMPLE STORAGE SPACE FOR STACKABLE HI-FI / DVD / SATELLITE EQUIPMENT ETC. 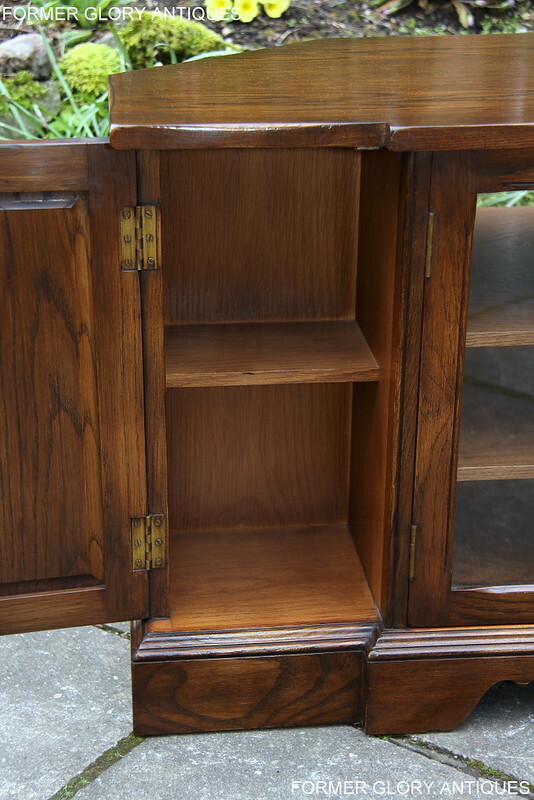 THE CENTRAL CABINET DOORS HAVE INSET GLASS PANELS, SOLID OAK FRAMES, WITH BEADED / CHAMFERED BORDERS AND THEY RETAIN THEIR ORIGINAL BRASS HINGES, MAGNETIC DOOR CATCHES AND TURNED OAK DOOR KNOB. 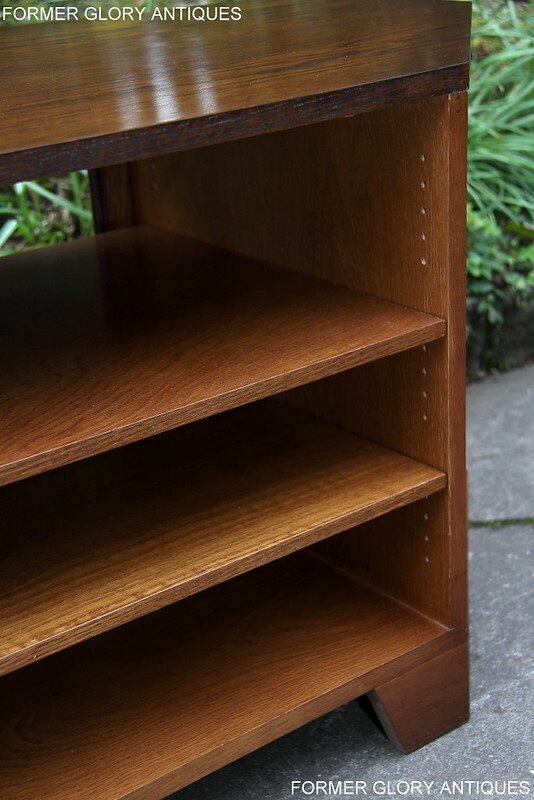 THERE IS AN ADDITIONAL SMALL CUPBOARD SECTION AT EITHER SIDE, EACH WITH A FIXED SHELF INSIDE, MAKING THEM IDEAL FOR STORING DVD'S, CD'S OR COMPUTER GAMES ETC. 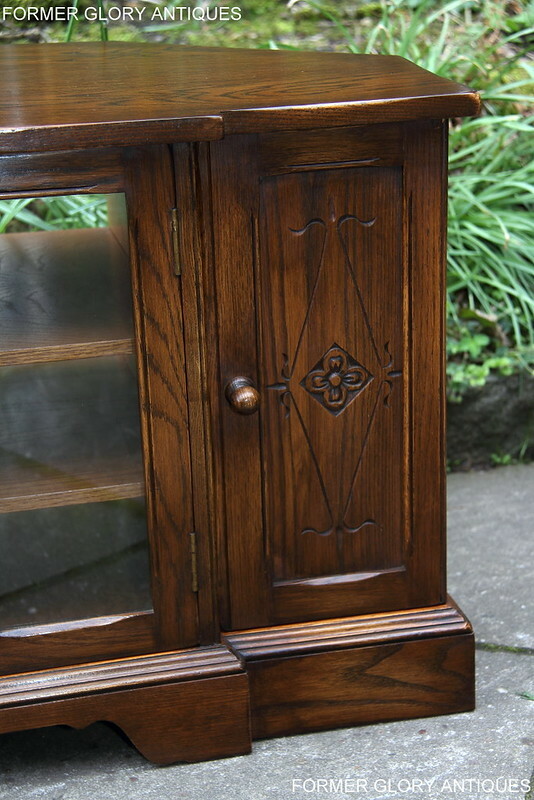 THE CUPBOARD DOORS HAVE A SOLID OAK, INSET PANEL IN EACH, DECORATED WITH 'CACTUS FLOWER' AND 'SCROLL LINE' CARVING, WITH MATCHING BEADED / CHAMFERED BORDERS. 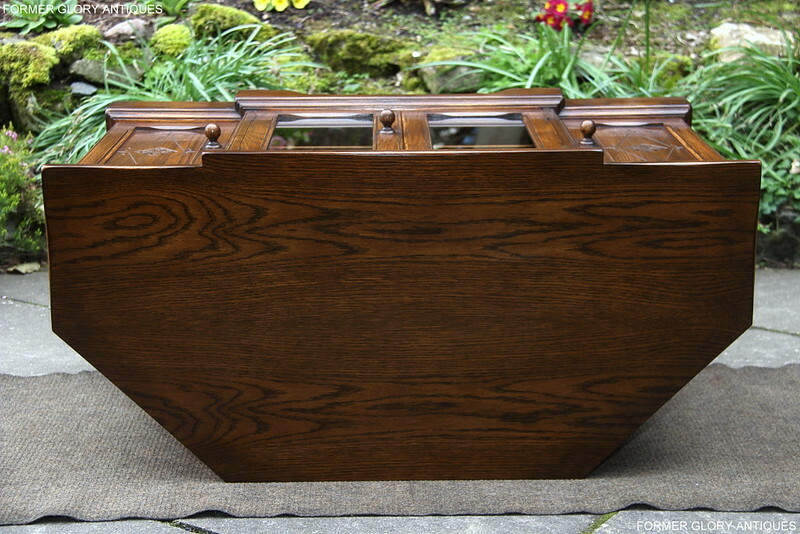 THE DOORS AGAIN RETAIN THEIR ORIGINAL BRASS HINGES, MAGNETIC DOOR CATCHES AND TURNED OAK KNOBS. 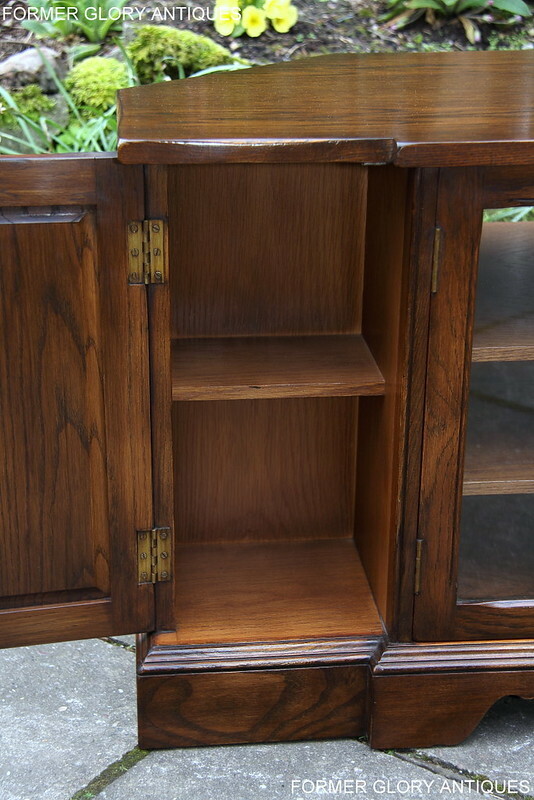 THERE IS A LARGE CUT-OUT SECTION IN THE BACK OF THE CABINET, FOR EASY ACCESS TO CABLES / WIRES ETC. 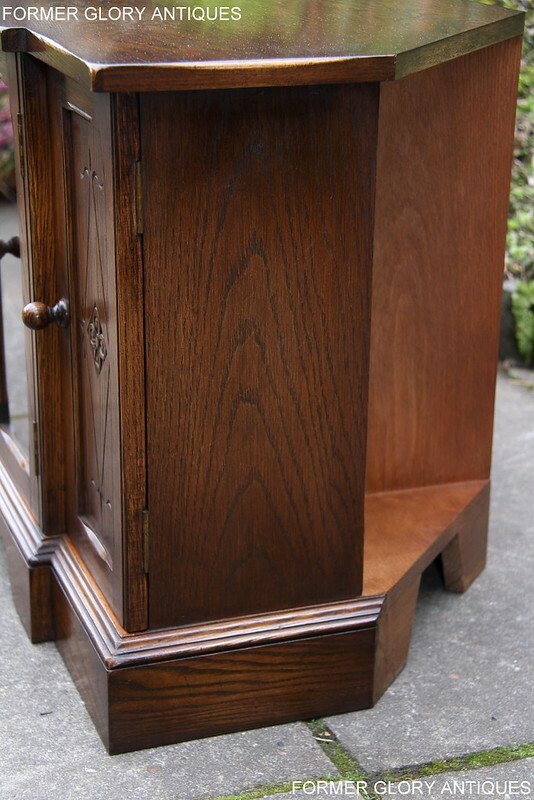 THE CABINET HAS PLAIN OAK SIDE PANELS AND IT STANDS ON A TRADITIONAL PLINTH BASE, WHICH HAS A MOULDED TOP EDGE AND DECORATIVE SHAPING TO THE FRONT SECTION. 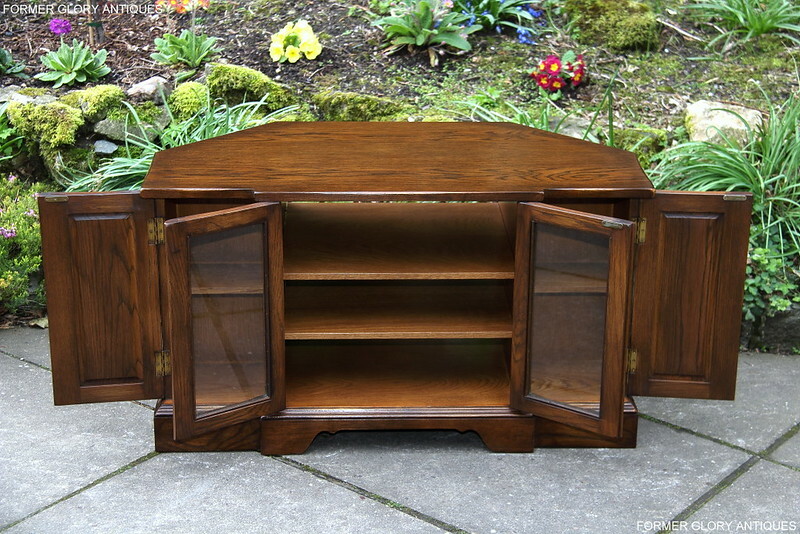 THIS SUPERIOR QUALITY 'BEVAN FUNNELL' 'REPRODUX', CARVED OAK, CORNER T.V. 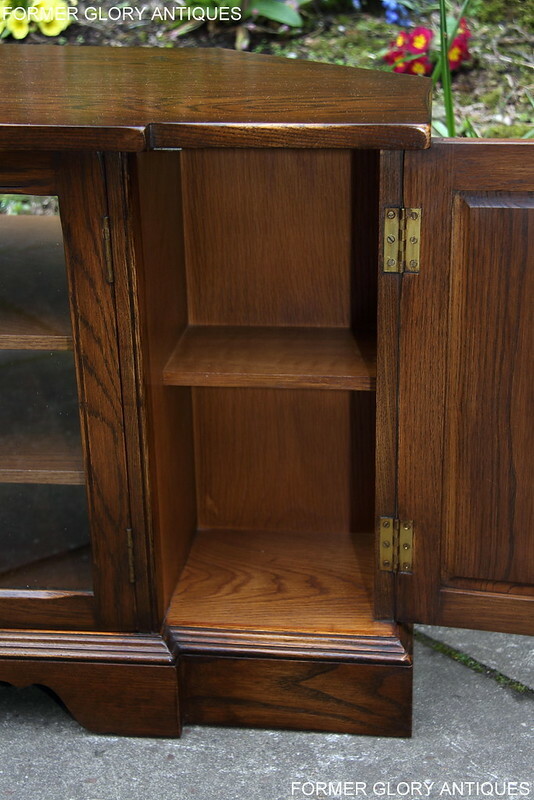 CABINET HAS BEEN CLEANED, RE-POLISHED, IT IS IN EXCELLENT / NEW CONDITION THROUGH-OUT, WITH ALL 'WEAR AND TEAR' / ''MINOR MARKS FROM USE'' / 'CHARACTER' (DAMAGE) BEING REMOVED. 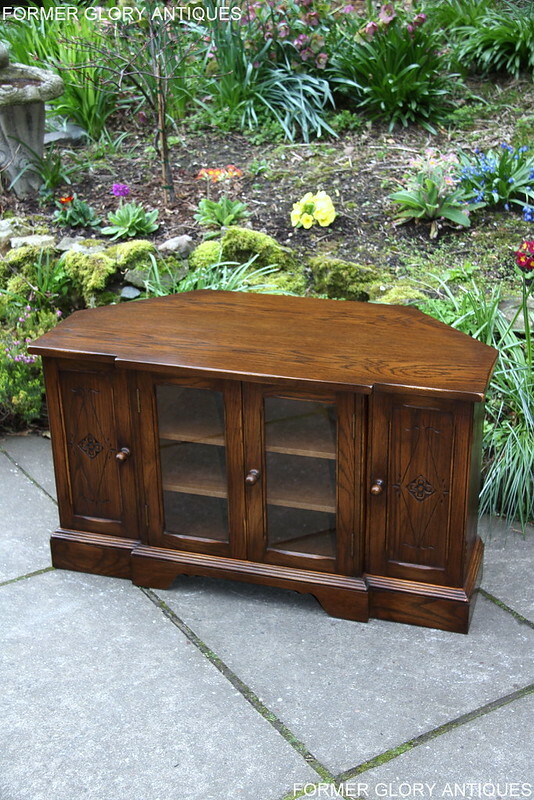 A STYLISH CARVED OAK CORNER T.V. 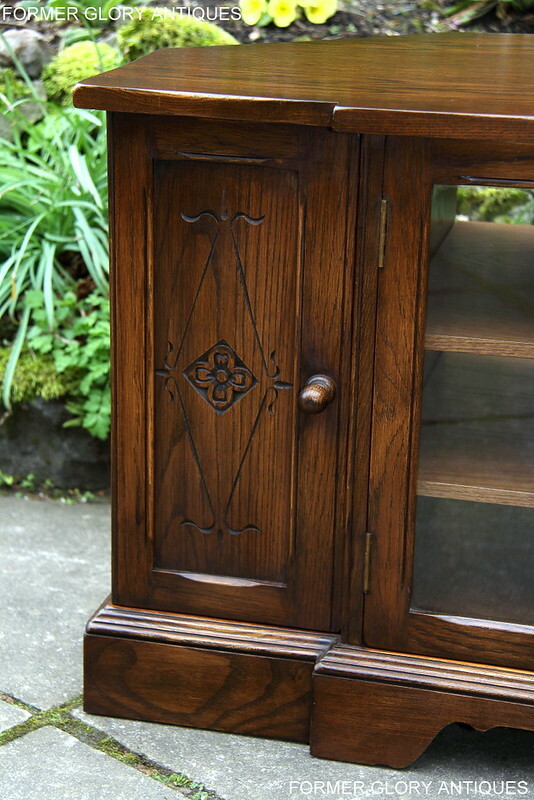 CABINET THAT WOULD BE A VERY USEFUL AND ATTRACTIVE ADDITION TO ANY HOME. 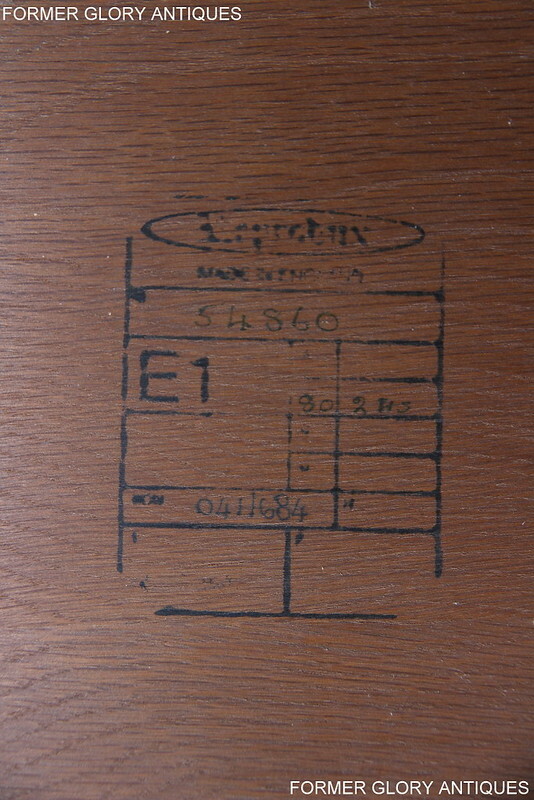 HEIGHT 21 1/2", WIDTH 37 3/8", DEPTH 18 1/2".